Not since Day After Tomorrow and 2012 have movie goers experienced the thrill of a deadly weather systems. 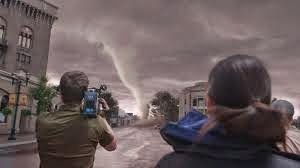 Director Steven Quale (Final Destination 5) with screenwriter John Swetnam (Step Up All In) mix up a little Twister with Project X camera angles of storm chasers and a small town in the path of an impossible storm scenario. Like most disaster films, audiences are usually put in the position of thinking what they would do in similar circumstances. It's safe to say the characters seem to react fairly predictably and conveniently considering what they are facing. It's no wonder the heart of the story is loosely drawn and more attention is paid to the flying trucks, airplanes, and parts of buildings raised by the sudden tornadoes. Pete (Matt Walsh) is contracted to provide footage of tornadoes for a documentary with his team of photographers and a meteorologist Allison (Sarah Wayne Callies) who seems to keep missing the storm touch downs. She insists that the storm is heading to the small town of Silverton with a weather system that seems to defy the usual patterns. Meanwhile in Silverton, the High School Vice Principal Gary (Richard Armitage) is having trouble with his two sons Donnie (Max Deacon) and Trey (Nathan Kress) who are filming their selfie video time capsules as part of their end of the year school project. Hence the reason for most of the POV camera work of the film as everyone seems to be filming everything as it happens. Gary is wondering if the school graduation should be called off due to the weather even though it's still sunny outside. The principal overrules his trepidation and the show must go on. Donnie who harbors a secret crush on Katilyn (Alycia Debnam Carey) and he leaves the filming of the graduation ceremonies to his brother in order to help Katilyn with her film project at the old abandoned mill. There's also a comedic element introduced in the form of YouTube Jackass fools filming each other doing ill advised stunts who join in the storm chasing. Titus is the state of the art armored storm chasing vehicle with cameras, high tech equipment, bracers to hold the Titus to the ground in 175 MPH wind, and a top turret to give panoramic views while filming while experiencing the middle of the eye of the storm. Pete is die hard chaser lives for the moment to get money shot from the center of the vortex. The visual effects of the multiple tornado system is obviously the only reason for this movie. The CGI tornadoes and the wake of destruction it leaves behind is probably why anyone would see this movie as it is done handled fairly spectacular. Particularly the fire tornado and the survivors riding out the final EF5 in storm drain. Edge of the seat stuff with a made for TV movie performances. And a good reminder to watch the weather channel before leaving the house.